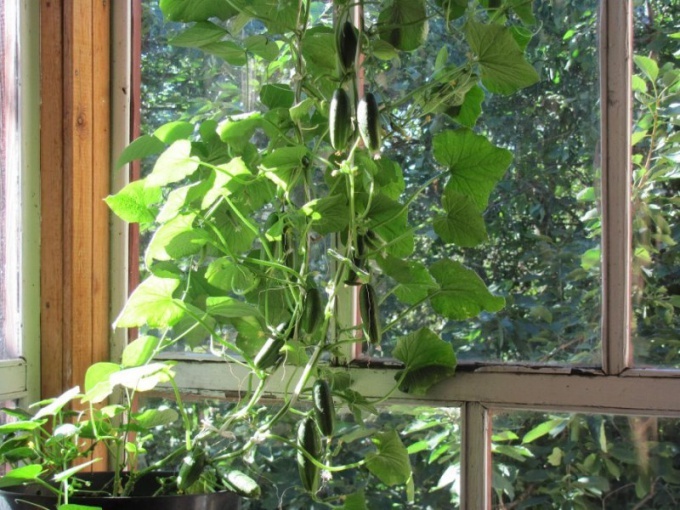 Growing cucumbers on the balcony, the balcony or the kitchen window has its own characteristics. To be able to harvest, the gardener must understand the features of farming of cucumbers and choose intended for planting for this variety. Growing cucumbers on the balcony often fond of elderly people, which is difficult to visit the suburban areas, but they have enough free time, take good care of the plants, therefore, can boast of significant achievements and good harvests Zelentsov. An important role in achieving this goal is played by the correct selection of varieties. Breeders displayed a lot of varieties and hybrids of cucumber for cultivation in a confined space, inaccessible to the bees. Classic varieties are parthenocarpic (self-pollinating) hybrids that are guaranteed to produce a crop on the balcony, the balcony and even on the kitchen window: "April", "cuckoo". The disadvantages of these hybrids can be attributed to their low resistance to disease and a relatively short period of fruiting, as well as unsuitable for canning – these plants are good for fresh consumption. To stretch in time to produce a crop, you can plant cucumbers at intervals of 15-20 days. With the proper allocation of crops can be generate fresh cucumbers throughout the season. If you want to grow a good crop of cucumbers, suitable for pickling and canning, it is necessary to pay attention to modern hybrids cucumbers-gherkins. Among them we can mention the "cucumber City", "Balcony". The scourge of these plants are compact, growing bunches cucumbers – several pieces from a single sinus. Pickles feature miniature size, good taste; they are crunchy, flavorful, perfectly suited for laying in jars for the winter. Larger fruits have a "Swallowtail" and "Blizzards", but their fruiting is quick to impact yield, so you need to regularly plant new plants. For larger balconies where there is no shortage of places suitable hybrids "Berendey", "emerald stream" quality Zelentsov excellent, fruiting stretched in time, but the length of the pipe does not allow to grow a large number of these plants. If the balcony most of the day is in the shade, it would suit shade-tolerant hybrids adapted to French conditions, "Mary", "Strutter", "Prestige", "Kosinski". What variety or hybrid cucumbers or choose, they all need timely watering and fertilizing, which in confined spaces is even more relevant than when growing plants in the greenhouse. Especially for the balcony cucumbers in specialized stores you need to buy nutritious soil mixture, complex fertilizer, throughout the growing period, regularly feed the plants to get a good harvest. The perfect solution for those who do not have a country site, but wants to see fresh homemade pickles on your table, can become a vegetable garden on the balcony. In this case, you not only please your loved ones and get delicious crops, grown with their own hands,but turn your balcony into a beautiful green garden. First of all, take care of the seeds. Given the specificity of plant growth and lack of natural lighting, it is better to purchase early-maturing varieties of greenhouse. Choose the seeds self-pollinated, otherwise you will have to pollinate them by hand. Select the place on the balcony where you will plant the seeds. Because cucumber is a thermophilic plant, more suitable room, facing South, South-East or South-West. If the balcony Windows face North, be sure to insulate them, eliminating the draughts and the ingress of cold air to the plant. Plant cucumbers in almost any container except aluminum: from the plastic boxes and ending flower pots. A prerequisite is that the pot should be at least 5 liters per plant and contain a hole for water drainage. As a primer use a mixture of compost, peat and fertile soil in equal proportions. Try every 5-6 kg of soil add one Cup of wood ash or use ready-made fertilizers. Before planting, soak the seeds of cucumbers for 10-12 hours. If you want to speed up germination, the seeds proustite. To do this, take a saucer or shallow dish, place several layers of filter paper, put the seeds on it and cover with another 2-3 layers. Moisten all with water, and with heating to maintain a temperature of about 30 degrees. Please note that the paper should not dry completely. Usually after 2-3 days the seeds will form the spine, which can be planted in the ground. Watering cucumbers need twice a day, morning and evening, supporting the natural moisture. Do not forget about feeding. Fertilize once a week with mineral fertilizers at the rate of 2 tsp in 3 liters of water, increasing this number during fruit formation up to 2 times. Because of the peculiarities of its structure, cucumbers need support. Once the whiskers appeared, attach the stem to the stake or stretched on the ceiling rope. As soon as 10-12 leaves, cut the tops to stimulate the growth of side shoots. 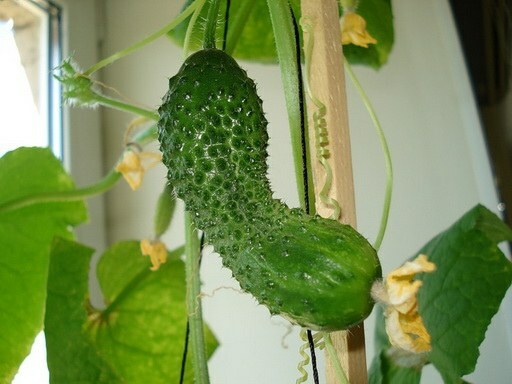 After 40-50 days, the cucumbers will bloom, and after 8-11 days from the ovary will be the first fruits. Easier to grow smooth and dlinnoplodnye hybrids that do not require pollination. Without any additional artificial lighting of cucumber on the windowsill you can grow from the end of February, using backlight for sowing can begin in late December. And how I want in the cold season to treat yourself to a spring salad of fresh cucumbers! You can certainly use store-bought vegetables, but the taste and aroma of they are very inferior to homemade. So why don't you try to grow room cucumbers? On a cold windowsill lay a Board or piece of izolon, the roots of seedlings are not frozen, and the glass can stick reflective film to enhance light. Growing cucumbers on a balcony only if it is heated. Advice 3 : How to grow cucumbers "balcony miracle"
Growing cucumbers in the home is becoming more popular. Using the balcony space, it is possible by the end of spring to the table with fresh, crisp cucumbers. For cucumbers more suited balconies and loggias oriented to the South-East or East. Balconies on the North side is worse than cold and poorly lit. You can use for planting pots, boxes, vases, cut the neck of the plastic cylinders out of the water. In the lower part of the tank is necessary to make 4-5 holes to remove excess liquid. The volume of the container in which you intend to raise cucumbers balcony should be about 5 liters. On one plant it is recommended to allocate 5 to 10 liters of volume. It is best to first plant one seed in plastic cups, and then, when they germinate, transplant into large pots (one pot, one plant). It is important to remember that cucumbers need plenty of water, so watering should be carried out regularly and to be generous. Fill the container with potting mixture should be to the upper edge of the remained 5-6 cm as shrinkage of the soil, it again will need to fill up to its former level. For cucumbers any loose soil, but it should not be clay or sod-podzolic earth, riding or peat. The acidity of the soil should vary from 6.6 to 6.8. For its determination one should use pH-meter. Limed acidic soil by adding dolomite flour, lime, or chalk melcorazmashisty. At a pH of 6.2-6.5 should be 10 liters of soil to make 5 to 10 g of dolomite. Preferred for planting cucumbers to use a prepared soil mix, limed and dressed with fertilizers. In order to grow a decent crop of delicious cucumbers, choose for planting parthenocarpic or self-pollinated seeds for pollination do not require the assistance of bees. Cucumbers of these species belong to the class of precocious. Optimal for germination of cucumber seeds is temperature 24-26 degrees above zero. When the weather's dry or germinated seeds can be sown directly into pots. If the weather is cool and unstable, it is better to plant on the balcony ready seedlings. In the ground for a "balcony" of cucumbers, you can make supplements that hold moisture (agroel). You need to sow seeds in well-moistened soil to a depth of about 2 cm on Top of them sprinkle sifted through a sieve of moist earth or peat. After germination the temperature should be maintained at 20-24 degrees. Higher temperatures may lead to stretching. Fertilize the seedlings 1-2 times, in the phase of the second and third true leaf. For this, suitable water-soluble complex mineral fertilizer (2 g per 1 liter of water).